There have been only a few occasions in my recent memory when, after bravely venturing out to try a completely different experience, I walked away kicking myself for never having tried it sooner. That was precisely what happened to me recently when I spent an evening aboard Bateaux New York, a glass-covered Spirit Cruise-owned ship that embarks daily from Chelsea Piers for a Hudson and East River dinner cruise. 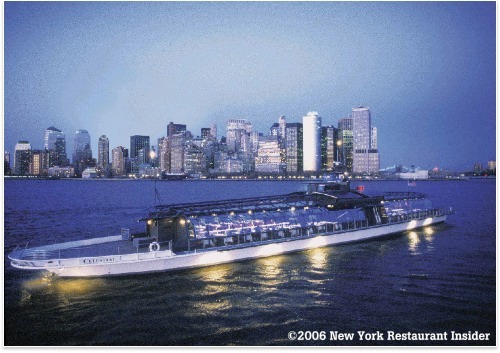 The ship, which seats 300 comfortably, skims across Manhattan’s calm rivers so smoothly that its easy to forget that you’re actually on a boat. The three-hour excursion around lower Manhattan is highlighted by a drive-by past the Statue of Liberty, giving passengers a dramatic up-close nighttime view of the Lady that, even for long-time New Yorkers, is breathtaking. 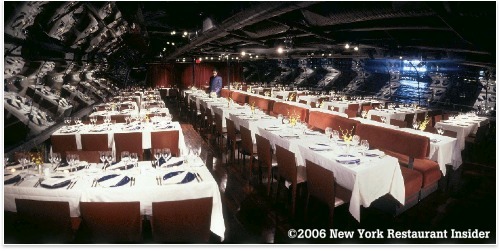 The boat’s interior has the feeling of a large roomy nightclub, and once the jazz band gets warmed up and dinner is well under way, you’ll find that there is more room to dance than many typical Manhattan land-based clubs. 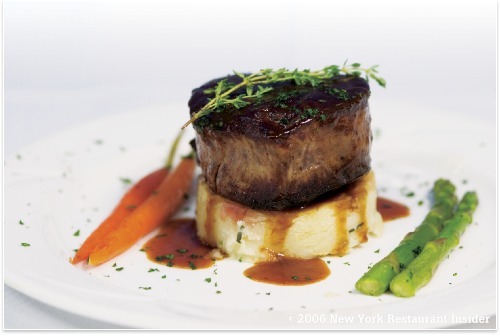 For those people who assume that the food on these day-cruises is, by definition, below the standards of Manhattan’s better restaurants are in for a pleasant surprise. 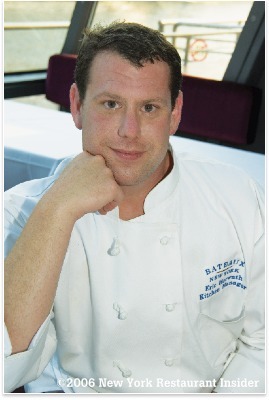 La Batraux’s menu, designed by Noëlle Ifshin and executed onboard by chef Eric Horwath, is both deliciously well-balanced with fresh ingredients and creative presentations. The chefs were even able to accommodate some special requests we had for a few of our finicky guests. Appetizer selections included Field Green Salad, Maryland Lump Crab Cakes, Bateaux Antipasto Plate, or Seared Rare Tuna Sashimi. The Entrees included Filet Mignon, Sesame Crusted Farm Raised Tilapia, Rotisserie Roasted Half Chicken, Braised Rosemary and Mint Lamb Shank, Honey BBQ Center Cut Pork Chop, or Grilled and Roasted Vegetable Lasagna. Dessert selections were Warm Valrhona Chocolate Torte, Vanilla Crème Brulee, Molasses Raisin Cake, or the Bateaux Dessert Sampler Plate.